I spent a few hours in the Pergamon Museum on the Museum Island in Berlin yesterday [13 September 2018], one of the largest museums in Germany and one of the most visited. 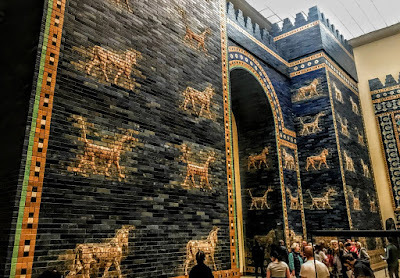 Over a million visitors visit the Pergamon Museum each year, primarily to see the Ishtar Gate from Babylon, the Market Gate from Miletus, parts of the reconstructed gates from the ancient Assyrian Palace, the façade of the Mshatta Palace and the Aleppo Room. The museum takes its name from the archaeological collection from Pergamon, including the Pergamon Altar, which has been displayed in the main hall. But this is closed to visitors at present as the museum undergoes a major overhaul. 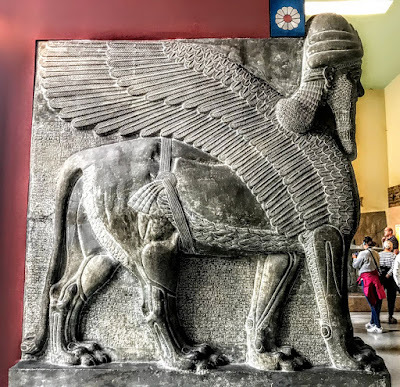 The Pergamon Museum is divided into three main sectors or independent collections: the Collection of Classical Antiquities, from ancient Greece and Rome; the Museum of the Ancient Near East; and the Museum of Islamic Art. It is difficult to know whether the acquisition of these collections should be compared, on the one hand with the adventures of some German Indiana Jones or Chester Beatty, or on the other with the plundering and despoliation of the Acropolis in Athens by Lord Elgin. The Pergamon Museum building was designed by Alfred Messel and Ludwig Hoffmann and was built over a period of 20 years, from 1910 to 1930. The collection dates back to the Prince-Electors of Brandenburg, and began with the acquisition of the collection by a Roman archaeologist in 1698. 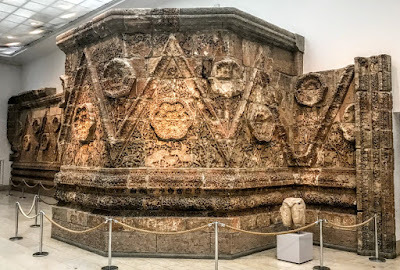 Part of it was made accessible to the public when the Altes Museum opened in 1830, and the collection soon grew and expanded with finds sent back from excavations in Olympia, Samos, Pergamon, Priene, Miletus, Didyma, Magnesia and in Egypt and Cyprus. The origins of the present museum are found in the Kaiser-Friedrich-Museum, now the Bode-Museum, on Museum Island. By the time that museum opened in 1904, it was clear it was not large enough to host all of the art and archaeological treasures being excavated under German supervision. At the time, German archaeologists were excavating sites throughout the Eastern Mediterranean and the Middle East. But the objects they sent back to Germany, many on a gargantuan scale, could not be properly displayed adequately in the German museums of the day. Wilhelm von Bode, director of the Kaiser-Friedrich-Museum, decided to build a new museum nearby for these collections. Messel began designing a large three-wing building in 1906. When he died in 1909, his friend Hoffman took over the project and building began in 1910. Work continued despite World War I (1914-1918) and the economic crisis of the 1920s, and the completed building opened in 1930. The Pergamon Museum was severely damaged at the end of World War II during the air attacks on Berlin. But many of the displays had been stored for safety places. When the Soviet army arrived in Berlin in 1945, troops collected many items in the museum items. Were they rescuing them looting and fires then raging in Berlin? Or did they see it as war booty? Most of the objects were returned to East Germany in 1958. But significant parts of remained in the Pushkin Museum in Moscow and the Hermitage Museum in Saint Petersburg. The museum collection is now divided between the Pergamon Museum and the Altes Museum. It includes sculpture from the archaic to Hellenistic ages as well as artwork from Greek and Roman antiquity: architecture, sculptures, inscriptions, mosaics, bronzes, jewellery and pottery. 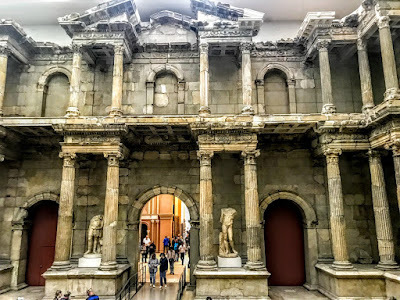 The main exhibits are the Pergamon Altar from the 2nd century BC, with a 113-metre long sculptural frieze depicting the struggle of the gods and the giants, and the Gate of Miletus from Roman antiquity. As Germany was divided following World War II, so was the collection. The Pergamon Museum reopened in 1959 in East Berlin, while what remained in West Berlin was displayed in Schloss Charlottenburg. The Ancient and Near East Collection displays objects found by German archaeologists and others as they carried out digs in sites from Assyrian, Sumerian and Babylonian culture. The main display in this collection is the Ishtar Gate from Babylon and the Processional Way that leads to it. They were built during the reign of Nebuchadnezzar II (604-562 BCE). Original glazed bricks decorate both the Ishtar Gate and the Processional Way. The reconstructed throne room and palace interior from the Kingdom of Assyria dates from the 13th to ninth centuries BC. The Market Gate from Miletus in western Anatolia, dates from ca 100 AD and is over 16 metres high. In addition, there are historical buildings, reliefs and lesser cultural objects and jewellery. When the Bode Museum opened in 1904, a section for Islamic art was created, but this was later included in the Pergamon Museum in 1950. This collection includes Islamic artwork from the eighth to 19th centuries, from Spain to India. The main attraction in this section is the Mshatta Façade. It comes from an unfinished early desert palace south of Amman in present-day Jordan and dates from 744 AD. It was a gift from the Ottoman Sultan Abdul Hamid II to Emperor Wilhelm II of Germany in 1903. Parts of the eastern part of the façade are still in Jordan, as wells as the rest of the ruins of the building. The Aleppo Room forms a separate display in the area. This is a richly-decorated reception room from a Christian broker’s home in the Syrian city of Aleppo, and dates from ca 1601-1603. 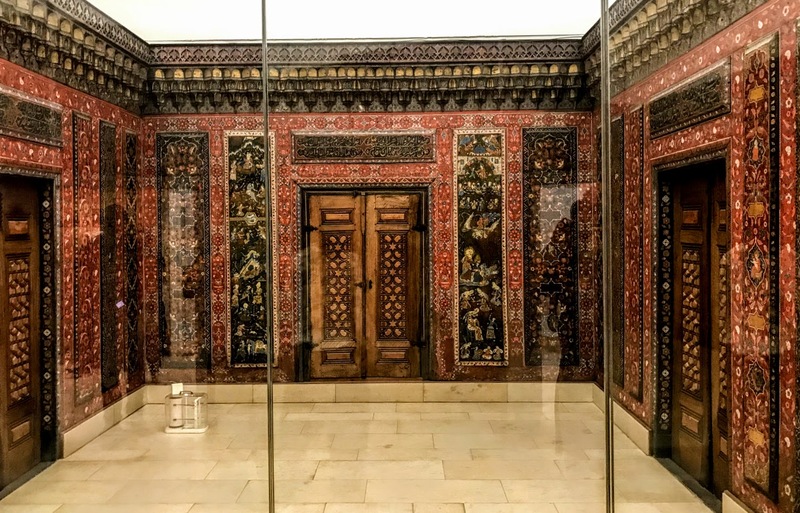 Other objects from the Islamic world include carpets, textiles, illuminated manuscripts, book bindings, ceramics, metalware and rock crystal objects, there is mihrab from Konya, the Sufi centre in southern Anatolia, and a niche from a Samaritan home in the Middle East. A plan to develop Museum Island includes an expansion of the Pergamon Museum, with connections to the Neues Museum, Bodemuseum, Alte Nationalgalerie and a new visitor centre, the James Simon Gallery. The Pergamon Museum will be redeveloped which means parts of the museum have been closed for the past four years, including the hall with the Pergamon Altar. Initially the reopening was planned for next year , but it may not be finished until 2023. One of the strong themes throughout the museum is the thread of continuity through all these civilisations. There is no one fixed time when the classical world comes to an end and the Byzantine world begins, and there is a sense of continuity between classical civilisation, the Byzantine world and Islamic culture. In many ways, the people who assembled these collections must also have been claiming a place in the continuity of civilisation for Germany at the turn of the 19th and 20th centuries. What went wrong then that some people in Germany within decades could lose that sense of continuity and try to forge a sense of superiority? With the current crisis in Syria, one wonders whether the Aleppo Room would ever have survived intact, and with the behaviour of Isis in Palmyra and other parts of the Middle East, I wondered whether the reconstructed exhibits from Babylon, Assyria and other places would still be there to see today. Is the Pergamon Museum the safest place for many of these objects today? And why is the Pergamon Museum not as controversial as the British Museum and the retention of the Parthenon ‘Marbles’ in London? Perhaps the answer is quite simple: there is a world of difference between Aleppo and Athens. But the Pergamon Museum challenges us not to think in terms of linear time, and certainly not to think of time in terms of mere centuries. Who knows what will separate Athens from Aleppo in centuries in come? The apartment I have been staying in on Tucholskystraße is in an interesting part of Mitte and Spandau close to the centre of Berlin. It is only a 15-minute walk to Unter den Linden, the once-elegant boulevard that runs through the centre of Berlin, from the great museums in the east to the Brandenburg Gate in the west. 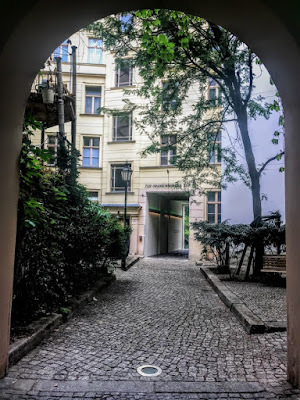 The front of the apartment opens onto Tucholskystraße, close to its corner with Oranienburgerstraße and the dome and towers of the Neue Synagoge (New Synagogue), while the main windows of the apartment look onto Auguststraße, and the bedroom windows look out into a courtyard and the gardens of the ‘Creative Quarter’ in the Heckmann-Höfe complex that was once the stables and carriage area of a 19th century brewery proprietor. 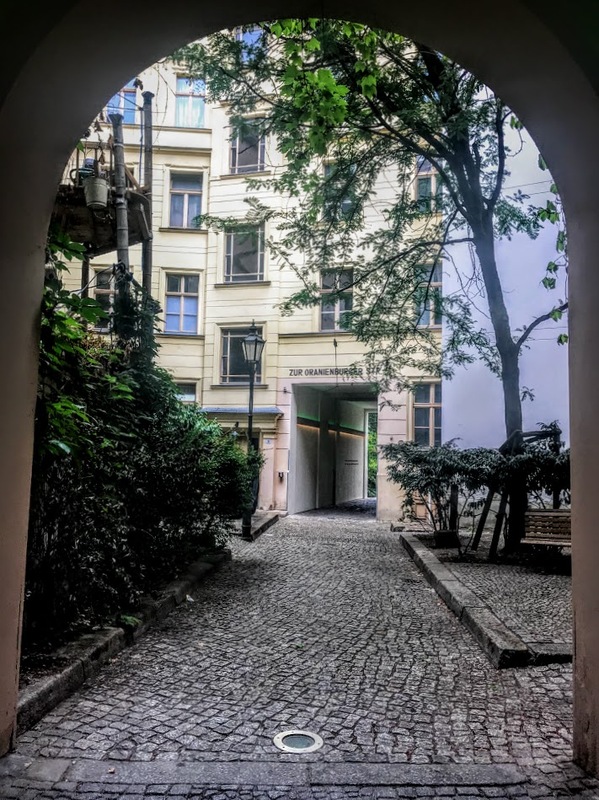 These three courtyards and their gardens lead from Auguststraße down to Oranienburgerstraße, and they are surrounded by residential buildings with ground-floor shops, galleries, art shops, cafés, bars and restaurants. Most of the buildings are listed buildings. The Heckmann farms are originally located in the Spandau suburb between the Postfuhramt and the Neue Synagoge, extend from Oranienburgerstraße to Auguststraße and Tucholskystraße. The Heckmann farms date back to the 17th century, but they were developed after 1691 into an area known as the Spandau suburb. The Spandauer Tor, which separated the district from the rest of the city, was demolished in 1750. The Oranienburger Straße area was built up in the early 19th century. A carpenter named Koehne built in the yard a coach house in the yards for his horses and carriages as the residential buildings on Auguststraße were being built. The area had taken shape by 1871, and in 1872 a new building was built at the corner of Tucholskystraße 34 and Auguststraße 9, where I have been staying this week. This building now forms another courtyard and is the final boundary of the area enclosed by Tucholsky and Auguststrasse to this day. Friedrich Wilhelm Heckmann, son of the industrialist Carl Justus Heckmann, bought these buildings in 1905 and so it became Heckmann-Höfe. Friedrich Heckmann’s heirs kept their interests in many of these buildings. But in 1950, a decree was issued by the East Berlin city council converting the property into the property of the people, and the management of the buildings was handed over to the Municipal Housing Administration. After the fall of the Berlin Wall, the former Spandau suburb was discovered and revived by artists. Many of the buildings were still intact, and they attracted artists, fashion outlets, clubs and squatters too. Dieter Heckmann, his brother and another 40 or so heirs to the property, had the properties reprivatised, and soon they all agreed to renovate and rent the remaining properties. A Berlin private investor acquired the area in 2014, with plans to develop a creative quarter. The building complex of Heckmann-Höfe has been converted into apartments and townhouses, the former warehouses have been leased to individual shop owners who value creative products, as well as the Galli Theatre and Garda, an Italian restaurant. We have strolled through the gardens in the mornings and again in the evenings, and had dinner last night in Garda. 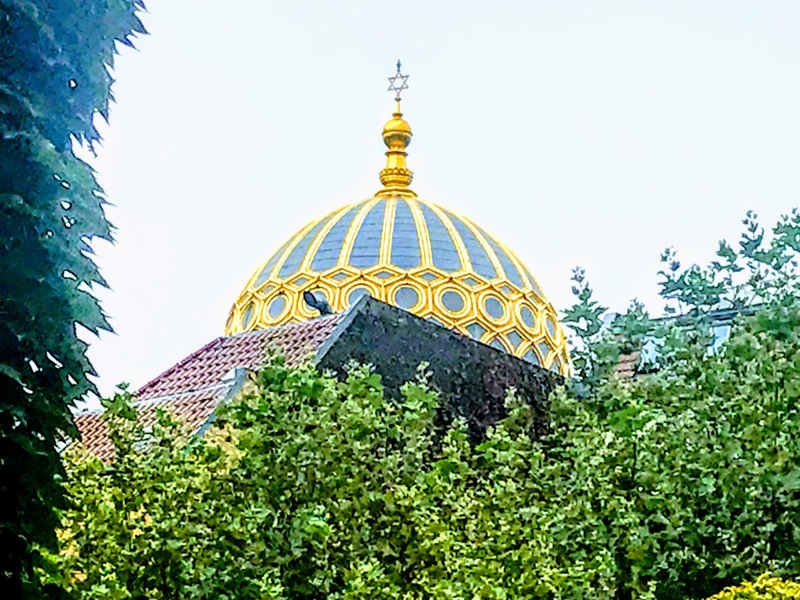 Sometimes above the trees and through the arches we catch glimpses of the dome and towers of Neue Synagoge and older buildings, reminders of the past and promises of hope for the future.